Item #31002: 10" diameter Cloisonne bowl with brown background and floral design on a carved wooden stand. 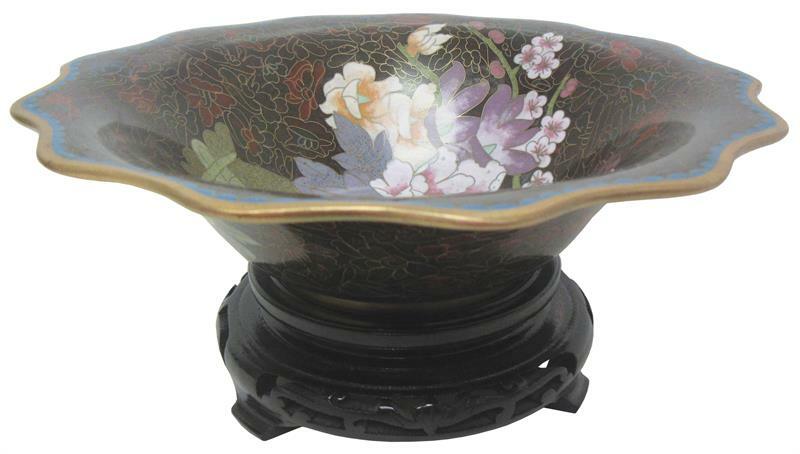 Item #31001G: 10" diameter plain edge Cloisonne bowl with Green background and Multi-Color still life & floral design on a carved wooden stand. Item #41501: Approx. 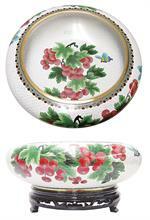 19" diameter lip design Cloisonne bowl with white background and apples & butterflies. On carved wooden stand. Item #AD-KTB-29C: Approx. 2 1/2"-2 3/4" Round Carnelian Agate Katori Bowl. Katoris are small bowls which are used by cooks in India to hold many condiments, such as curry or yogurt. They're handy for holding rings or earrings that are worn daily. Item #GS-205: 6.5"x7.5"x1.25" tall, light Green Chrysoprase Bowl with Brown Matrix. Item #MN-NPJ-BWL-125: Approximately 7"x3"x5.25" Nature's Paintbrush Jasper bowl; size, shape and color varies. Item #GS-306: 3.5"x4.75"x1.5" tall Black, Brown, Cream and Tan Picture Jasper Bowl. Item #GS-397: 6.5"x6.5"x2.25" Black with Gray Zoisite Bowl and Green with Black Zoisite Frogs.